Things are a happening in and around the village with roadworks, a new pathway and at last … (well maybe) .. a permanent drop off zone and recycling facility. 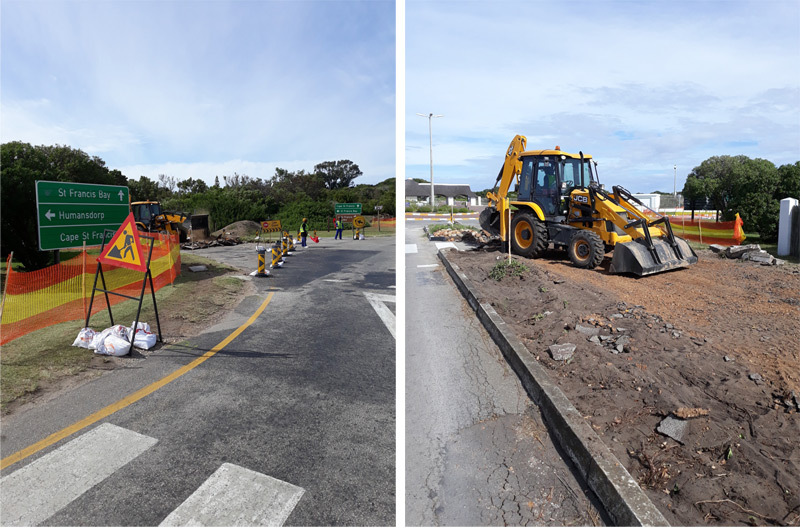 Those using the R330 to / from Humansdorp or visiting The Links will have already encountered the roadworks in progress at the entrance circle to St Francis Bay. In a joint venture between St Francis Property Owners SRA and St Francis Links the entrance to the town is about to be beautified offering a nice welcome to visitors to our town as well as, and probably more importantly, better road quality. It is a three month contact and was awarded to Mawethu Civils with EAS the engineers supervising the project. This is an SFPO project funded through the SRA Levy and co-sponsored by St Francis Links. During the construction process there will be a certain amount of disruption to traffic which will include the partial closure of the entrance as well as Lyme Road North and South. SFPO and the contractors have asked e asked that motorists to exercise both patience and caution during this period. Motorists are encouraged to access and exit the Village via Homestead Road or Tarragona Road. Heavy trucks and delivery vehicles are requested to use Tarragona Road. The project will be completed ahead of the Easter holidays. In other news put out by SFPO yesterday it seems the long delayed pathway project between the CBD and Sea Vista is about to get underway. The project is is being funded by the Kouga Wind Farm Community Trust under the guidance of the SFPO who are in the process of appointing an Engineer and Project Manager to oversee the contract. 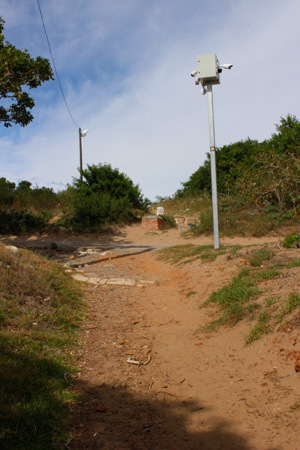 The existing pathway is notoriously dangerous with regular reports of criminal elements preying on woman and children and the pathway being both lit and covered by CCTV it will hopefully give peace of mind to those using the pathway particularly afe dark. And in news that will bring joy to those who are commited to recycling, it seems almost certain that the drop-off point set up over the holidays will become a permanent facility. In news from the council, the drop-off and recycling is Jeffreys Bay has already been finalized with Enviroman Recycling Company appointed to manage the facility. Hopefully this augurs well for St Francis Bay as it is an essential. News from SFPO is that the depot will accept glass, tins, recyclable plastics and paper/cardboard and all garden refuse providing it is dropped off in bags that will removed by the Municipality on a regular basis. Garden services will be allowed to make use of this facility provided their garden refuse is in bags. Anything that is not in bags will have to be taken through to Humansdorp. It is hoped that this facility will help to reduce the incidences of illegal dumping of garden waste in public open spaces and undeveloped plots. Building rubble cannot be accepted at this depot and must still be taken through to Humansdorp. Nice to see things happening! This year’s JBay Winterfest will take place from 6 – 22 July, and looks set to be another exciting 2 weeks of surfing, live music and a whole lot more. The Corona JBay Open Men’s and Women’s surfing contests will be the anchor events of the festival, with the best male and female surfers in the world descending on JBay and the perfect waves of Supertubes. Filipe Toledo from Brazil is the defending champion, and he also won the tournament in 2017. Therefore this year he will be going for a hat trick, which has never happened at a Championship Tour level at this venue. Filipe redefined high performance surfing at this contest in 2017, with a fast and futuristic aerial surfing performance, resulting in a perfect 10-point ride for one incredible wave, as well as the contest victory. Jordy Smith from Durban is also a two times event champion and is always a well-supported surfer, with the local crowd cheering him on from the rafters whenever he takes off on a wave. He is always one of the best surfers in the water, and has the distinction of surfing a perfect 20-point heat back in 2017. Jordy finished fifth on the World Surf League Championship Tour’s Jeep Leader Board in 2018 and will be wanting to improve on that ranking this year. Wade Carmichael from Australia was the stand-out surfer last year, competing on his first year on the Championship Tour. The rookie took out the talented Conner Coffin (USA) in the quarterfinals and Jordy Smith in the semifinals. Coming up against Toledo in the final, the powerful natural-footer surfed with confidence and aggression, but fell on a final air attempt in the last few minutes, and finished runner-up to Toledo. His power surfing was well-suited to the long, open faces, and he will no doubt be full of confidence coming into this year’s event. Kelly Slater, the USA’s 11-times world champion, will be competing for the last time as a Championship Tour surfer this year, having announced his upcoming retirement at the end of 2019. Slater has 4 victories to his name at this tournament, and has often described it as one of his favourite events in the world. Slater injured himself while free-surfing here in 2017, and has been struggling with his form ever since, but has made it clear that his final year on tour is coming with a focused and determined competitive act. It is a well-known fact that Slater is hungry for a 12th World Title, and this year will be his last chance to secure it. On the Women’s tour, event defending champion and current world champion Stephanie Gilmore from Australia will bring her smooth and stylish approach to the event again, hoping to claim her second win to follow on from her victory at the inaugural event last year. We can expect Lakey Peterson (USA) and Carissa Moore (Hawaii) to be hot on her heels this year, along with surfers like fierce Brazilian competitor Tatiana Weston-Webb, and the dynamic and popular Hawaiian surfer Coco Ho. This year will once again have the popular free music shows, and they will be moving across to the Supertubes Park. Live In The Park will feature a range of top South African bands and musicians performing live. Last year the live music was one of the highlights of the festival, with large crowds gathering to watch the bands, enjoy the vibes and chill with a few Coronas at sunset after long days of excellent surfing. The band names will be announced soon. Many of the bands who performed live last year called the JBay Winterfest one of the highlights of their year, so we can once again expect top bands to be part of this year’s jol. Alongside the surfing and the live music there will also be a Skins Fishing Tournament, a Funduro dirtbike event, as well as a Trail Run and more. The details of these events will follow. Continuing the blog post on my adventure last week when we visited the Kouga Dam followed by breakfast at Padlangs in Patensie. Just a reminder to those readers living in the Kouga region, considering the hot weather we are experiencing, the lack of rain and a long dry winter ahead of us saving water must remain a number one priority. The dam is just 48% full and restrictions remain in place for we certainly do not want to see a repeat of last winter when the situation became critical particularly in the Hankey / Patensie district where they were limited to water for only a few hours a day. Breakfast at Padlangs is a pleasant affair sitting in the garden with birds chirping and fluttering around you but a warning if you are a coffee lover, rather order the fresh orange juice. Leaving Padlangs we headed for the real purpose of our adventure, a visit to Baviaanskloof. I had read a little about the Baviaanskloof before embarking on this adventure and had it penciled near the top of my bucket list so I certainly felt a little excitement now that I was about to visit what forms part of one of South Africa’s largest protected wilderness areas. Many readers familiar with the region will know and have probably visited the reserve but for those who haven’t, the area of the total reserve covers some 1.2miliion acres, that is around 2.5 million rugby fields! It forms part of the Cape Floristic Reserve that was declared a World Heritage Site in 2004. The kloof or ‘Valley of the Baboons’ lies between two mountain ranges, the Baviaans and Kouga with the road, or more accurately the pass, running the length of the reserve some 200 kilometres east to west. A rather long drive to traverse the entire length in a day for most of the journey one can barely exceed 20kph. Our trip thus was planned only to cover a part of the pass and return home the way we came. My blog on Friday was entitled “use a tour guide when sightseeing” and if you are planning to go into the Baviaanskloof and have never done the trip before, I truly recommend that your first trip be with someone who knows some of the facts and history. Even if you have your own 4x4 vehicle it is probably best you go with someone who knows the road, the conditions and some the history and environment. As mentioned in Fridays post the some six of the seven biomes found in South Africa exist in this area and nowhere is it more noticeable once you have passed through the entrance to the reserve. The vegetation changes constantly, one minute you are travelling through almost sub-tropical bush with inviting little streams bubbling through the green undergrowth and the next minute through stark Nama Karoo then just as suddenly into fields of fynbos. During one of our times next to a small stream Shaun asked the question of when last we had seen a dragonfly. Think about it, when did you last see a dragonfly? They used common round water but one hardly ever sees them anymore but we saw some beautiful ones dipping and rising around the streams. And so the climb began, higher and higher and then even higher. Stopping off for a pee break atop the mountains, the view was majestic with mountains and valleys stretching seemingly forever whichever way one looked. Shaun took us on a walk down a path to show us the site of what was an early form of a zip line set up by farmers in the area to transfer goods and supplies across the valley. The one inch cable is still there to be seen in surprisingly good condition. Unfortunately I am unable to walk but short distances so never made it to the actual end point where it was set up but the ingenuity of the farmers brings to mind the phrase “’n boer maak plan”. Sitting there atop the mountain with the vlews across mountains and valleys for as far as one could see I was almost tempted to burst in song with that 70’s Carpenters hit “I’m sitting on top of the world looking down on creation”. Police foiled a robbery of an internet café and managed to arrest one of the four suspects. A preliminary investigation has revealed that police foiled a business robbery in progress. A 51-year-old business owner alleged that four suspects armed with knives had just entered his café and were demanding cash, when a patrol police vehicle thwarted their action. A case of attempted business robbery was opened for investigation and there was no person injured during the incident. A 26-year-old man is due to appear at the Humansdorp Magistrate’s Court tomorrow on charges of attempted business robbery. The incident occurred on Sunday night when a passing police patrol vehicle while driving past an internet café at Ketse Street, KwaNomzamo noticed a commotion inside. The police vehicle stopped so as to check if any assistance was needed, four men stormed out of the café and started running in different directions. Police gave chase on foot and managed to arrest one of the four men. Humansdorp Cluster Commander, Brigadier John Lebok commended members for their swift action. “ Your presence in the hot spot areas has certainly paid off. Continue with diligence and passion!” he added. NSRI Jeffreys Bay duty crew were activated on Saturday evening following reports of a man rescued from the surf at a beach at Jeffreys Bay Point, and suspected to be suffering a heart attack. The NSRI rescue vehicle responded and the SA Police Services, Gardmed ambulance services and Private Care ambulance services responded. It appeared that the man was swimming when he collapsed suspected to have suffered a heart attack. A bystander assisted him from the surf and raised the alarm. On arrival on the scene a a 55 year old male was found to have been rescued from shallow surf by a bystander and CPR (Cardio Pulmonary Resuscitation) efforts were commenced. Despite extensive CPR efforts conducted by NSRI medics and by paramedics after all efforts were exhausted sadly the man has been declared deceased. The man and his wife are foreigners on a holiday to Jeffreys Bay with friends from Johannesburg. The wife and the friends are being supported by Police and Condolences are conveyed to his wife, family and friends. The body of the man has been taken into the care of the Forensic Pathology Services. The lady who rescued the man from the surf has been commended for her involvement. Earlier in the day NSRI Wilderness duty crew were activated following reports from the owner of the Wilderness Guest Lodge and additional eyewitnesses of a swimmer appearing to be in difficulty off-shore of Lientjiesklip. NSRI Wilderness, WC Government Health EMS, George Fire and Rescue Services and Er24 ambulance services responded. NSRI rescue swimmers responded and on arrival on the scene the rescue swimmer assisted a man from the surf safely to the beach. The man had managed to find a submerged sand bank approximately 70 meters off-shore after he was swept out to sea by rip currents which he used to stand on until help arrived..
A bystander had launched a canoe but he had lost sight of the man in the surfline and he is commended for his effort. The swimmer, a 78 year old man from Germany, was medically checked by paramedics and not injured he required no further assistance.